Want to Help Start a Revolution? The New Green Revolution 20X is Starting. Harvest Chapel Mission started in 2004, to help develop small farm equipment for low income farmers. We also send it with missionaries working overseas. 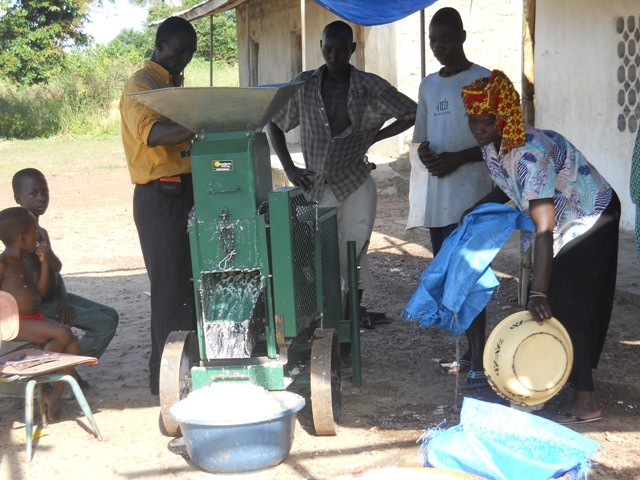 We have a diesel powered hammer-mill and other equipment currently operating in Sierra Leone, Ghana, Uganda, and Haiti. This equipment has helped reduce farm labor substantially. In the case of grinding cassava root, which is labor intensively hand processed mostly by women; a 3 week task for 2 women, has been reduced to 4 hours using less than a gallon of fuel. (A 60 fold production increase) Additionally, we currently have press equipment in Sierra Leone undergoing testing that is able to press palm oil that can be used as an alternate (carbon neutral) fuel for the diesel engine. THE PROBLEM: In many developing countries, food production relies primarily on rain-fed agriculture, resulting in lack of food security. Small-scale irrigation can bring substantial gains, but is often too costly. Lack of transport, storage facilities, and economic clout mean crops must sell immediately after harvest at low prices. Therefore they must buy food right before harvest, at high prices. This results in seasonal hunger. Nearly 80% of people live in rural areas and their options to improve livelihoods are largely dependent on agriculture. WHAT IS NEEDED? A 20 fold increase is needed. A 2-5 fold increase using hand power, while useful as a starting point, is only marginally above the energy cost to produce a product. This will not keep them out of the poverty hole. A 20 fold increase using diesel power can pay for the fuel cost, pay for the equipment and repairs, return a fair profit, and free up labor to perform more value added/higher paying jobs that the equipment helps create. Runs on carbon neutral fuel when available – Virgin Oil -200 gallons per acre Palm Oil, WVO - Filtered waste vegetable oil. The 10 hp air cooled diesel engines we have been using on our equipment currently do not meet EPA emission standards. To continue supplying this equipment with diesel engines we are planning to import partial engines and modify them to meet current emission standards. We project the cost to modify and test these engines to meet the latest EPA emission standards to be 35,000 dollars. Any additional money received above the actual costs will be used to send additional equipment to low income farmers overseas. Please visit our Indiegogo fundraiser site to make a donation. A donation of any amount would be appreciated. If you have a mission that you think could benefit from this equipment please e-mail us at harvestchapelmission@yahoo.com. WHAT IF EACH SMALL FARMER IN A DEVELOPING COUNTRY COULD FEED 20 PEOPLE?